Add a small splash of color to any room of your home. Fresh flowers enhance decor while they emit enjoyable fragrance. Now you can display them in any room, no matter how little space you have. This compact vase can hold a small grouping of flowers and/or plants, along with water to keep them fresh. The powerful suction cup on the back side will enable you to secure it to any mirror, window or similar, smooth surface, and it will stay there until you take it down. Start your day off right with flowers on your bathroom mirror, or make cooking in your kitchen more enjoyable when you add a bouquet on the window over your sink, or the back splash behind your counter. This is a relatively small vase. If you would prefer a larger one that can hold more flowers that are longer, check out the Single Stem, Single Bulb, Trumpet Shape and Three Blossomversions. It certainly looks similar to glass when in operation, but this little flower vase is actually made from clear plastic. If you would prefer a glass vase with suction cup, we also carry one of those. This plastic version offers some advantages over that one, but some people may prefer the look or material of the glass one. When full of flowers, you will notice that this vase expands to fit what is inside. After you empty it out, it is able to become totally flat which makes it extremely easy to store almost anywhere, or take with you when necessary. The durable material also makes this vase lightweight in comparison, which could make it easier to handle, or more able to hold a larger amount. If accidentally dropped, it will never break, nor could it ever break due to slippage while washing. This product is incredibly easy to use, so it will allow anyone to add color and fragrance to any part of their home. There is no special trick or skill required to use this device. If cut to the right size, and then placed into the vase with even spacing, any grouping of flowers will create a visually stunning arrangement. The most important part of using this vase, is the place in which you stick it. Textured walls and other uneven surfaces will not allow the suction cup to maintain a strong bond. Areas made of glass, metal and other smooth materials will be your best bet. Once an ideal location has been determined, it is important to clean it, even if it doesn't look dirty. After it has been cleaned, you will also need to allow it to dry fully prior to mounting the vase. If the surface is dirty, you could have trouble getting the vase to stick. If the area remains moist after cleaning, you could have a problem with sliding that would be avoided once dry. After the surface is ready, simply add your desired flowers to the vase, and then fill about half way with water. Once the arrangement is all set, simply stick the suction cup in the location you have prepared, and apply firm direct pressure to lock it in place. Use with fresh cut flowers and water, fake ones made of silk, real ones that have been dried, or even live plants with dirt. This product offers one of the best ways to surprise a loved one, or just display flowers in non-traditional locations. Stick a gift bouquet where it is sure to get noticed, and give them an affordable gift that they can use over and over again. You will be able to cut fresh flowers from your garden and enjoy them in any room of your home, or attach an arrangement to a desk or file cabinet at work. Greet visitors with colorful blooms on your front door, or pamper guests with fresh flowers on a night stand or bedroom mirror. The possibilities for enjoyment are nearly endless with this useful decor item. Order Yours Today! Vase Shape Oval shaped main body with tapered opening. Where to Use Stick on any window or mirror. Also works well on other similar surfaces too. 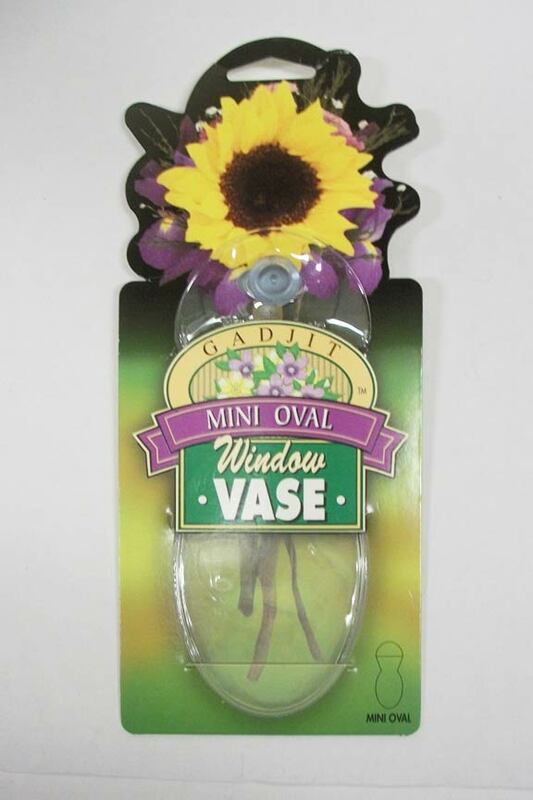 Mini Oval Window Vase - Add a little touch of color and fragrance almost anywhere. Holds a small amount of plants or flowers and water to keep them fresh. Order Yours Today!